If you're here from the hop, welcome to the end of the trail- I'm your last stop. If you're here because you wuv me, awwww! Thanks for dropping by! I recently saw a challenge for paper piecing and realized I hadn't done that in a while so the boxes and flowers are pieced. I added dots to Lexi's shirt just because I wanted to, nothing more. I used Copics to color the image. If you haven't visited the rest of the hop stops, here they are in order. Don't forget to comment along the way- there will be two random winners who will be announced on Wednesday's GIU post. Thanks again for dropping by and have a great remainder to your weekend! Love your card! The colors are great. I love your card!! I am fairly new to Unity stamps, and this girl is just so super cute!! Love your Lexi card & it's colors!! Your Lexi Girl card is adorable, Jen! I love the repetition of the dots and the colors make me think of Lexi as a sweet and friendly young lady. I love how you colored Lexi! The colors just jump out. Also love the repetition of the dots. Beautiful card! Super sweet card - your colouring is lovely ! Lexi is one of my favorites! Your coloring is fabulous. Beautiful card. Oh my, Jen, this is gorgeous. Lovely piecing and coloring for her. So fabulous, all of it. Love this card. The coloring is wonderful. The background papers really pick up the colors. The stamp makes me wish I was much younger and could take off on the bike. Your coloring is awesome!! Love this card! Wonderful image! Love the paper piecing! Great colors and patterns, fantastic card! Amazing image work. Well done. Love, love, love this card! Colors are so pretty and fun! 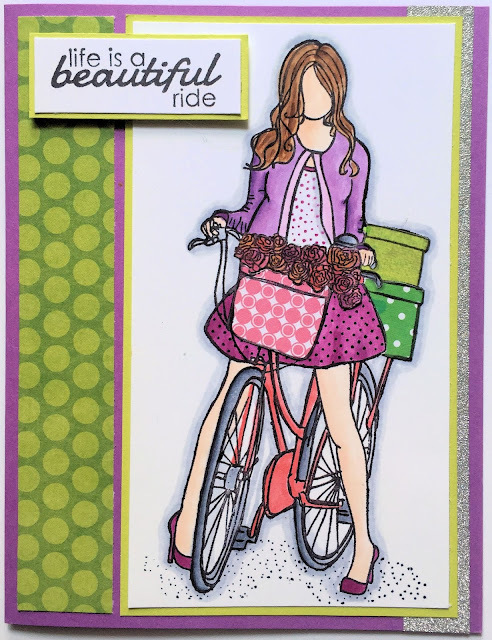 Very Pretty card, I love all the polka dots going on! Great card and love the polka dots you added! Pretty card, cute idea adding the dots to her shirt. I love how you've colored your girl! The color of your designer paper goes so well with her. Oh my goodness Jen, you have done a fantastic job on Lexi. I love the paper piecing and your colouring is fabulous! ♥ it! Stunning card. Amazing colouring. I love this stamp. Lovely card,so full of colors,details and creativity.It's fabulous. What a beautiful card you created, Jen! I love the bright colors and the patterned papers you chose. It is perfect for spring and summer. Life is a beautiful ride! Just love the pattern and detail you added to her! Beautiful colors!!! Beautiful colors and coloring! Love it! Thanks so much for hopping! It looks amazing. I want more stamps. I need a lot of practice.